inmates in prisons and jails all over America. 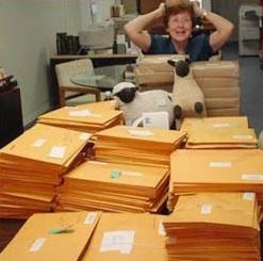 online donation to Little Lambs Inc.
Eileen Sala surrounded by just a fraction of the monthly mail. We have students in 783 jails and prisons across America. We are currently serving approximately 2,300 students as of January 2017. Many of these students require assistance with return postage. Our yearly postage costs range from $15,00 - $20,000. Little Lambs Inc. is an official 501[c] Not for Profit Organization. Only 20% of our budget is spent on administration costs.